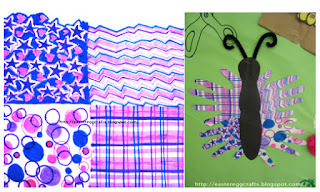 These little butterflies made with magic markers and construction paper sure come in handy when you need a quick way to decorate your classroom for spring! Little ones can also learn the parts of a butterfly while crafting their butterflies. 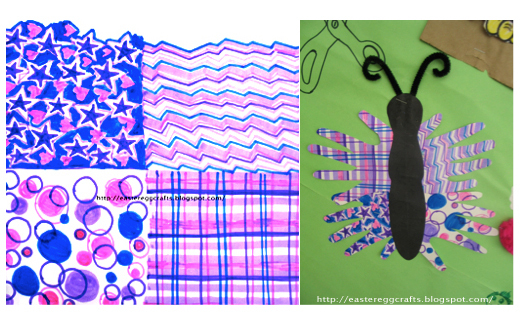 Students can learn about patterns and colors with this assignment. First they will need to fold a white sheet of paper in half twice and fill in each of the four spaces with patterns of shapes and colors of particular selection. After they have completed this step, students will then need to trace around their hands four times within each square of their designed paper. Cut these hands out to form the wings of your butterflies. I stapled their wings to some simple shapes of a butterfly's thorax cut from black construction paper. You can also add a few chenille stems for antennae. This little kindergartener is so proud of her creation. What seems to be old-fashioned to us is always entertaining to a five year old. It is one of the many blessings of being new to the world. Every little innocent thing holds some fascination for the very young. Many of these butterflies did not make it to the bulletin board. 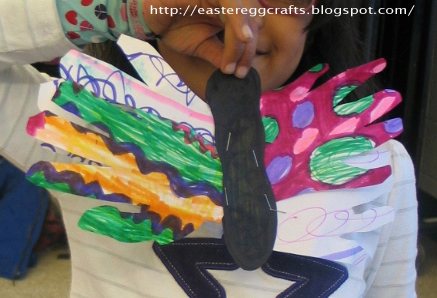 My kindergarteners loved this butterfly craft so much, they tried to sneak their paper butterflies home! I saw them, however, stuffing their new friends into their backpacks before I could collect all of my bulletin board trim! I stapled the butterflies all over my display areas after students finished this art project. What an easy fun way to decorate bulletin boards!